Taken at 7:30AM—on our way to drop the kids off at daycare. If we all look this happy before 9AM, we must be doing something right. It's been over 6 months since I've returned to work full-time. Shout out to all the working parents out there, it's one hard gig. 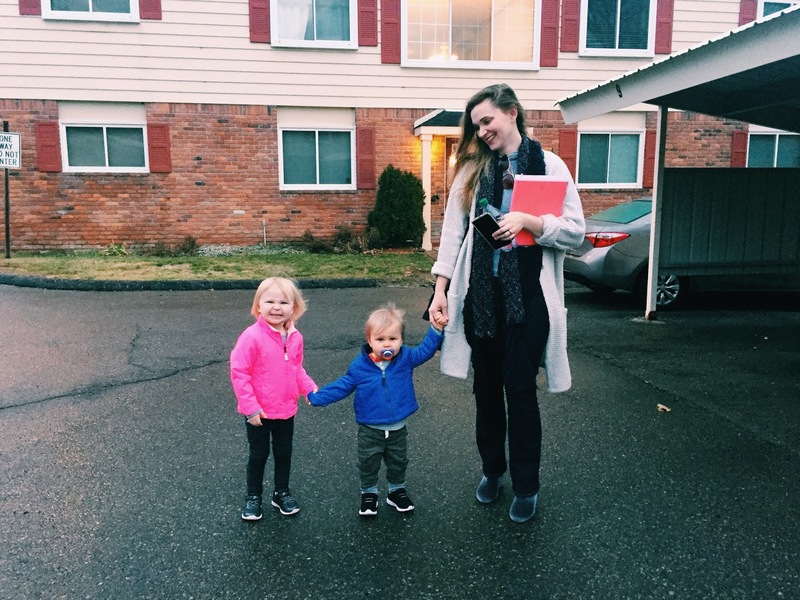 Having been both a stay-at-home mom and a full-time working mom, I've noticed a couple differences. Staying at home full-time pushed me to a mentally-exhausted breaking point, and working full-time pushes me to a physically-exhausted breaking point, which...I sort of knew would happen. I went back to work because I couldn't be pushed to my mental limits, but I wasn't prepared for the level of physical exhaustion that comes from working full-time. Overall, I've enjoyed it, and I think I've made the transition (fairly) seamlessly. Ella's always enjoyed going to daycare and she's now able to help Archie, so I haven't had uncontrollable pangs of mom-guilt. Tim and I have both recognized that having some level of daycare in our day-to-day is healthy for the entire family. And even if I worked part-time or stayed at home full-time again, we'd have the kids in daycare for a handful of hours during the week. The hardest part has been getting dinner made without having a cup of coffee to get me through roasting the potatoes, keeping up on the cleaning, and keeping up with a consistent writing schedule (this post has been half-finished for 2 weeks). Come Friday night, I'm exhausted and when I wake up on Saturday, the first thing I want to do is go out to breakfast and relax with the family. The last thing I want to do is clean my entire house, but Tim and I have adapted to this new lifestyle together, and we often tag-team the laundry, vacuuming and all the chores adults just can't get enough of. I have been curious what my life would look like if I stayed at home full-time with the kids while in Michigan. Having the opportunity to go out on dates with Tim and hang out with my best friend on Saturday night has greatly impacted my well-being, so I think if I were a stay-at-home mom while living here, our life would be drastically different than it was out West. Everything has its season, and with the unpredictability Tim and I have come to appreciate over the past few years, I can only assume life will change again in due time. But this season of our lives calls for me to work, so that's what I'll do. As newlyweds who faced an over-drafted bank account a time or two, I'll never take a job and an income for granted. There have been so many moments, while driving from any given Point A to Point B when I've been completely overcome with a sense of "is this real, do we really live here? We don't have to get out a plane in a week?" And, like waking up from a good dream, I re-settle back into my new reality a little unsure but content and smiling. Tim would often ask me while we were packing up to move out East if I was excited, because I hadn't shown much enthusiasm. I seemed to approach this recent move as any other, he thought. But it's only because it (and has) felt surreal. While living out West, Tim and I had no reason to believe we could make this move happen (did I mention the over-drafted bank account?). So my life motto, since moving back here, is perspective is everything. We have our hard days, I have long days at work, kids get sick and we face sleepless nights, but I have every reason to carry out my days with a good attitude and end my days with a grateful heart. 5AM comes all too quickly every morning, but I grab my half-caf coffee and roll out the door happy to have another day—8 months down, who knows how many more to go.